The woman fatally shot by two officers Sunday enjoyed family barbecues, wrote poetry and as a mother of four was, “Doing it on her own,” her brother said. 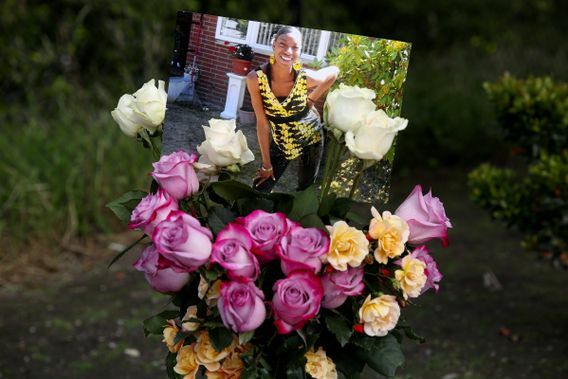 One thing that made Charleena Lyles special was the fun-loving way she danced. “She was so animated,” said her brother, Domico Jones, struggling to paint a picture with words and almost chuckling as he recalled Lyles moving to a hip-hop beat. Some other things he’ll remember about her: She looked forward to the Fourth of July and family barbecues. She didn’t know how to drive, but she knew how to rap. She wrote poetry “that would touch hearts.” And she loved her four children. The 30-year-old was short and slight, weighing less than 100 pounds. That might be what confuses Jones most about his sister’s death Sunday at the hands of police. “She was nobody that you would ever think would be intimidating to a police officer,” he said the day after two officers fatally shot Lyles in her Northeast Seattle apartment. They were responding to her report of an attempted burglary, and police say she displayed a knife. Three of her children were in the home, and she was pregnant, relatives said. Family members were scheduled to meet with an attorney Monday evening, Jones said. They have said they believe race was a factor — Lyles was African American, while the two officers are white. Reared south of Seattle, Lyles had a hard childhood. She grew up around drugs and “had to go through times,” Jones said. Her mother died when she was a teenager, so she and her siblings relied on each other. Despite their troubles, the siblings enjoyed good times. Jones remembers Lyles calling in to the old KUBE 93 radio station to rap over the air. He never would have dared. Things were going well for Lyles a decade ago. She landed an internship at a coffee company in Federal Way through the THRIVE program, which helps homeless people and people at risk of becoming homeless secure stable work. The internship led to a regular staff job, Poverty Bay Coffee Company co-owner Alice Olmstead said. Lyles worked as a cashier, cook and barista. Lyles had two children at the time and Olmstead would sometimes give her rides home. Though her small house was clean and organized, it was clear there were a lot of people living there, Olmstead said. Olmstead worked with the Federal Way Fire Department to get Christmas presents for Lyles’ children and once took her and other workers to Seattle to see “The Nutcracker” ballet. Lyles was captivated. “It’s heartbreaking to me that her life has ended this way,” Olmstead said. Eventually, Lyles moved on from the coffee-company job. Court records and interviews with relatives describe someone trying hard to overcome tremendous challenges. Lyles’ third child, a daughter, was born with Down syndrome and required extensive care, Jones said. She told a therapist conducting a court-related mental-health evaluation last June that she had been homeless for 10 years. “I believe I need counseling. I believe I am suffering from depression,” she said at the time, according to the therapist’s report. Recently, Lyles was dealing with a lot of stress, Jones said. She was worried about Child Protective Services taking her children and, living without a car at Brettler Family Place in Magnuson Park, was isolated from relatives south of the city, her brother said. The apartment complex is for formerly homeless people. “As far as mental issues, I think it was more like she was having a mental breakdown,” Jones said. “It just became hard for her. Jones was planning to teach Lyles how to drive, he said, choking up. At least two of Lyles’ children attend Seattle schools, and a group of teachers and staff members plan to wear “Black Lives Matter” shirts Tuesday to show support. “It’s time to stand together for a black family that has been torn apart,” said Sarah Arvey, a Hamilton Middle School teacher taking part in the expression of solidarity. The group also plans to gather for a rally Tuesday evening in Magnuson Park before marching to a larger gathering at Brettler Family Place. Seattle Public Schools sent extra staff to meet with students Monday at two schools that are close to Magnuson Park in Northeast Seattle, district spokeswoman Kim Schmanke said. The PTA at nearby Sand Point Elementary wrote on Facebook that students had heard stories about police killing a woman while her children were present. The school provided a room as a safe space for students who weren’t ready to enter their classroom. He doesn’t know exactly what happened in his sister’s apartment Sunday, but Lyles had told him she didn’t feel comfortable in the building. She wanted to move.